It seems like all of New York’s streets are under perpetual construction and repaving, and now thanks to the art work of Juliana Santacruz Herrera, we know Parisians feel the same. Disgruntled with the potholes and unfixed cracks in the streets of Paris, Hererra decided to beautify her surroundings. 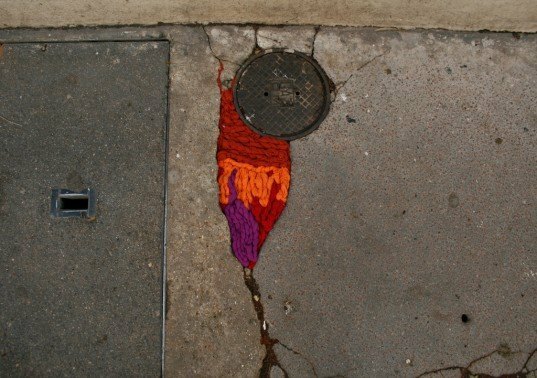 Armed only with yarn and knitting needles, she decided to take her woven repairs to the streets. Street art has had an upswing of popularity in the past few years, often coming off more as vandalism or graffiti than art. But Herrera’s street pieces are undeniably beautiful. Using the pale grey asphalt streets as her canvas, she adds bright and punchy color to an otherwise dismal palette. New York City based artist Olek employs a similar yarn and “guerilla knitting” technique, crocheting over abandoned bikes and poles throughout the city. She even knit over an existing piece of public art. But Herrera’s work takes it a step beyond, interacting with the cityscape and drawing attention to municipal neglect. Using brightly dyed yards and fabrics, she braids and weaves yarns together for site-specific pieces, injecting a cheerful rainbow of colors in varying shapes and sizes. The results mesh art, fashion and nature – and all coincide to bring a smile to cold cheeks in the grey winter as we await spring months. Now here is a true optimist, seeing decay and disrepair as an opportunity and venue to share some renegade – and smile-inducing art. Tres bien! Street art has had an upswing of popularity in the past few years, often coming off as more vandalization and graffiti than art. But Herrera’s street pieces are undeniably beautiful. Using the pale grey asphalt streets as her canvas, she adds bright and punchy color to an otherwise dismal palette. New York City based artist Olek also employs yarn and “guerilla knitting,” crocheting over abandoned bikes and poles throughout the city. 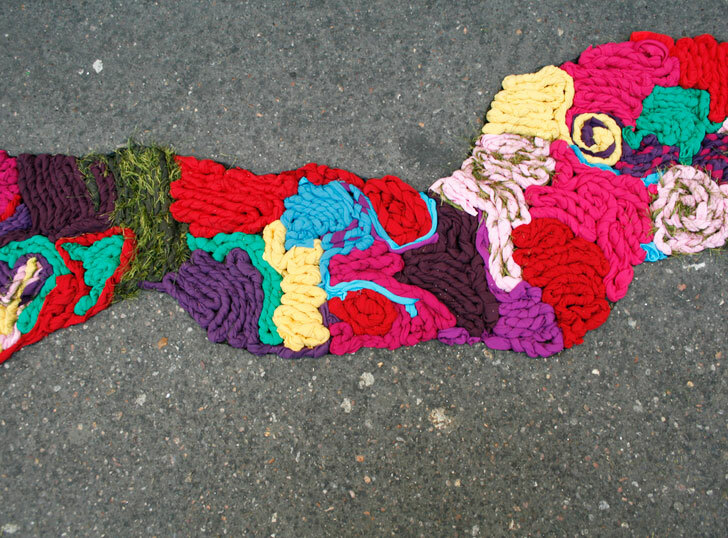 She even knit over an existing piece of public art. But Herrera’s work takes it a step beyond, interacting with the cityscape and drawing attention to the city’s neglect. Using brightly dyed yards and fabrics, she braids and weaves them together for each site-specific piece, injecting a cheerful rainbow of colors in varying shapes and sizes. The results mesh art, fashion and nature- and all coincide to bring a smile to cold cheeks in they grey winter to spring months. Now here is a true optimist, seeing decay and disrepair as an opportunity and venue to share some renegade – and smile-inducing- art. Tres bien!